An abstract base class for item Views. See WTableView or WTreeView for a description. Returns whether alternating row colors are used. When enabled, rows are displayed in alternating row colors, according to the current theme's definition. When the event happened over an item, the first argument indicates the item that was clicked on. Closes the editor for the given index. If saveData is true, then the currently edited value is saved first to the model. If saveData is true, then the currently edited values are saved to the model before closing the editor. Returns the content alignment for a column. Returns the signal emitted when a column is resized by the user. The arguments of the signal are: the column index and the new width of the column. Create an extra widget in the header. You may reimplement this method to provide an extra widget to be placed below the header label. The extra widget will be visible only if a multi-line header is configured using setHeaderHeight(). The widget is created only once, but this method may be called repeatedly for a column for which prior calls returned 0 (i.e. each time the header is rerendered). Returns a page navigation widget. You may want to reimplement this method to provide a custom page navigation bar. You can use the currentPage(), pageCount(), and setCurrentPage() methods to set or get the page information, and listen to the pageChanged() signal to react to changes. Implemented in Wt::WTreeView, and Wt::WTableView. Signal emitted when double clicked. When the event happened over an item, the first argument indicates the item that was double clicked on. Handles a drop event (drag & drop). The event object contains details about the drop operation, identifying the source (which provides the data) and the mime-type of the data. The drop was received on the target item. The drop event can be handled either by the view itself, or by the model. The default implementation checks if the mime-type is accepted by the model, and if so passes the drop event to the model. If the source is the view's own selection model, then the drop event will be handled as a MoveAction, otherwise the drop event will be handled as a CopyAction. Opens an editor for the given index. Unless multiple editors are enabled, any other open editor is closed first. Reimplemented in Wt::WTreeView, and Wt::WTableView. Returns the extra header widget. This processes the event for internal purposes (such as selection or editing) and emits the clicked() signal. You may want to override this signal to override the built-in selection or editing behaviour. Handles a double click event. This processes the event for internal purposes (such as editing) and emits the doubleClicked() signal. You may want to override this signal to override the built-in editing behaviour. Handles a mouse down event. This emits the mouseWentDown() signal. Handles a mouse up event. This emits the mouseWentUp() signal. Signal emitted when a header item is clicked. The argument that is passed is the column number. Signal emitted when a header item is double clicked. Returns the header item delegate. Returns the horizontal header alignment for a column. Returns if a column is hidden. Returns whether column resizing is enabled. Returns whether an editor is open for a given index. Returns wheter an item is selected. When selection operates on rows (SelectRows), this method returns true for each element in a selected row. Returns whether sorting is enabled. Returns whether sorting is enabled for a single column. Returns the default item delegate. Returns the delegate for rendering an item. Returns the delegate for a column. Returns either the delegate that was set for the column, or the default delegate. Returns the delegate that was set for a column. Returns 0 if no delegate was set for the column. Event signal emitted when a "character" was entered. The keyPressed signal is emitted when a key is pressed, and a character is entered. Unlike keyWentDown(), it is emitted only for key presses that result in a character being entered, and thus not for modifier keys or keyboard navigation keys. Event signal emitted when a keyboard key is pushed down. The keyWentDown signal is the first signal emitted when a key is pressed (before the keyPressed signal). Unlike keyPressed() however it is also emitted for modifier keys (such as "shift", "control", ...) or keyboard navigation keys that do not have a corresponding character. Event signal emitted when a keyboard key is released. This is the counter-part of the keyWentDown() event. Every key-down has its corresponding key-up. Signal emitted when a mouse button is pressed down. This signal is emitted only when 'over' an item (the model index is passed as first argument is never invalid). Signal emitted when the mouse button is released. When the event happened over an item, the first argument indicates the item where the mouse went up. Signal emitted when page information was updated. Returns the number of columns that are used as row headers. Returns the set of selected items. The model indexes are returned as a set, topologically ordered (in the order they appear in the view). When selection operates on rows (SelectRows), this method only returns the model index of first column's element of the selected rows. Signal emitted when the selection is changed. The selection model keeps track of the currently selected items. Sets the content alignment for a column. The default value is Wt::AlignmentFlag::AlignLeft. Enable or disable column resize handles for interactive resizing of the columns. The default column width is 150 pixels. The width must be specified in WLength::Pixel units. Enables the selection to be dragged (drag & drop). To enable dragging of the selection, you first need to enable selection using setSelectionMode(). Whether an individual item may be dragged is controlled by the item's ItemIsDragEnabled flag. The selection can be dragged only if all items currently selected can be dragged. Enables drop operations (drag & drop). 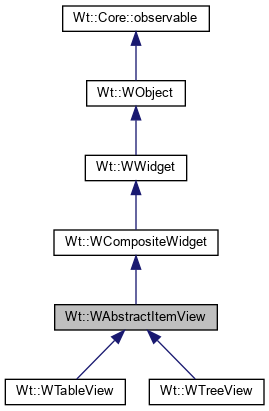 When drop is enabled, the tree view will indicate that something may be dropped when the mime-type of the dragged object is compatible with one of the model's accepted drop mime-types (see WAbstractItemModel::acceptDropMimeTypes()) or this widget's accepted drop mime-types (see WWidget::acceptDrops()), and the target item has drop enabled (which is controlled by the item's ItemIsDropEnabled flag). Drop events must be handled in dropEvent(). Configures what actions should trigger editing. The default value is DoubleClicked. Sets the header alignment for a column. The default alignemnt is horizontally left, and vertically centered. (Wt::AlignmentFlag::AlignLeft | Wt::AlignmentFlag::AlignMiddle). Valid options for horizontal alignment are Wt::AlignmentFlag::AlignLeft, Wt::AlignmentFlag::AlignCenter or Wt::AlignmentFlag::AlignRight. Valid options for vertical alignment are Wt::AlignmentFlag::AlignMiddle or Wt::AlignmentFlag::AlignTop. In the latter case, other contents may be added below the label in createExtraHeaderWidget(). When enabeld the view can be sorted by clicking on the header. Sets the header item delegate. This item delegate is used for rendering items in the header. The previous delegate is not deleted. This item delegate is for all columns for which no specific item delegate is set. The default item delegate is a WItemDelegate. This setting only affects a multiline header, and the default value is true. When set to false, the header itself will not wrap (as with a vertically centered header), and thus extra widgets will not shift down when there is a long header label. Sets the default item delegate. Sets the delegate for a column. A delegate previously set (if any) is not deleted. The root index is the model index that is considered the root node. This node itself is not rendered, but its children are. The default value is an invalid model index, corresponding to the model's root node. Replaces the current selection with indexes. When selection operates on rows (SelectRows), it is sufficient to pass the first element in a row (column 0 ) to select the entire row. The selection behavior indicates whether whole rows or individual items can be selected. It is a property of the selectionModel(). By default, selection operates on rows (SelectRows), in which case model indexes will always be in the first column (column 0). Alternatively, you can allow selection for individual items (SelectItems). By default selection is disabled (NoSelection ). Enables or disables sorting for all columns. Enable or disable sorting by the user on all columns. Sorting is enabled by default. Enables or disables sorting for a single column. Enable or disable sorting by the user for a specific column. Sorts the data according to a column. Sorts the data according to data in column column and sort order order. The default sorting column is -1: the model is unsorted. Returns the current sorting columm. Returns whether the view is sortable. Returns the current sorting order. Signal emitted when one or more fingers are removed from the screen. When the event happened over an item, the first argument indicates the items where the touch ended. The indices in the model index vector match the indices in the changedTouches() of the WTouchEvent. Signal emitted when one or more fingers are moved on the screen. When the event happened over an item, the first argument indicates the items that were touched. The indices in the model index vector match the indices in the changedTouches() of the WTouchEvent. Signal emitted when a finger is placed on the screen. When the event happened over an item, the first argument indicates the item that was touched. Signal emitted when one or more fingers are placed on the screen. Validates the editor for the given index. Validation is done by invoking WAbstractItemDelegate::validate(). Returns the vertical header alignment for a column.